It was quite a fight to bring this bread to pass. First of all, it’s an “indirect” bread, meaning that it requires a preferment rise before the regular rise. That means it’s at least a two-day project to do it right. Then, the next day, it takes another four hours of mixing, kneading, rising, and baking. It’s a long process. On Saturday night, I made the “poolish”, which is a very wet gloppy goo, and let it raise overnight in the fridge. On Sunday, when I went to work on it, I mixed the full dough (which is still quite wet), and while it was rising, my dogs got to it and made off with over half the dough. I was NOT happy. It wasn’t until the following Friday and Saturday that I would have the proper time available for the whole process. Fortunately, this time it worked. I started the night before baking, mixing the poolish. Of all the processes, it was probably the easiest. I simply mixed the three ingredients thoroughly, overmixed it, really, then covered it in plastic and set it aside for an hour or two. It raised up nicely. I put it in the fridge to continue the fermentation overnight. Longer ferment times really make for more rich flavors! The next day, I took it out of the fridge pretty early. It was a bit bigger, but not by much. I let it sit for an hour or so, to warm up a bit. After a while, I measured out the water and sprinkled in the yeast, to activate it. Then, I got a large ceramic mixing bowl, and sifted in the flour, and added the salt. I added in all of the wet ingredients (the yeast/water mix, the oil, and the poolish). The poolish was very gluteny, even though it was runny, so it was difficult to measure. I ended up spooning it into a measuring cup. I got a good, basic mix going on with a heavy wooden spoon. ...But then it got ugly. I stuck my hand in the goo and started squeezing it through my fingers, turning the bowl as I went. I would squeeze, turn, release, then grab another glob and squeeze again. It felt sooo gross. This was taking the place of a normal knead. As I was doing this, I could feel it getting more smooth and gluten-y. I did that for almost 8 minutes. It was very tiring on the fingers. Finally, I rubbed what I could off my fingers then rinsed my hands. It really was a mess. Then, I sprinkled a small handfull of flour out onto the tabletop, in about the size and shape of a dinner plate. I dumped the goo dough onto it (scraping the sides with a spatch), and sprinkled more flour on top. I floured my hands and grabbed each side and pulled, stretching the dough outward. I folded the right side over the middle, then the left side, to form a small square, which I gently flattened a bit. I turned it 90°, and did the stretch and folds again. Then I covered it with a tea towel and let it sit for a half hour. I mixed the herbal oil next. I simply put the oil in a jar, the set the jar in some really hot water for a time. I added in all of the herbs and seasonings and stirred it up. The heat makes the oil absorb the flavors a bit more. After that rest, I did the stretch and fold again, and after that, another 30 minute rise/rest. Finally, after one more stretch and fold, it was ready for shaping. I got the coals lit. I could tell it was a lot of coals. I was shooting for a final temperature of 450°. I got out the oval roaster and poured a pretty liberal amount of the herbal oil in the bottom, enough to cover. I put in the dough and, using my fingertips, stretched it out to the edges, or at least close to it. I pressed my fingertips into the dough, all the way to the pot, to make the traditional dimples. I poured on more herbal oil, then sprinkled on the onions, garlic, and tomatoes. Then I let that rise some more. I also put in the short-stemmed thermometer. Actually, I think now that I really went overboard on the toppings. The amounts shown above should be more effective. In the end, having lots of toppings kept it from getting a nice, crisp top crust. In fact, all of the cheese browned, then singed instead. In a pizza, the crust is there to give a delicious carriage for the toppings. In focaccia, the bread is the attention, and the toppings should simply enhance it. 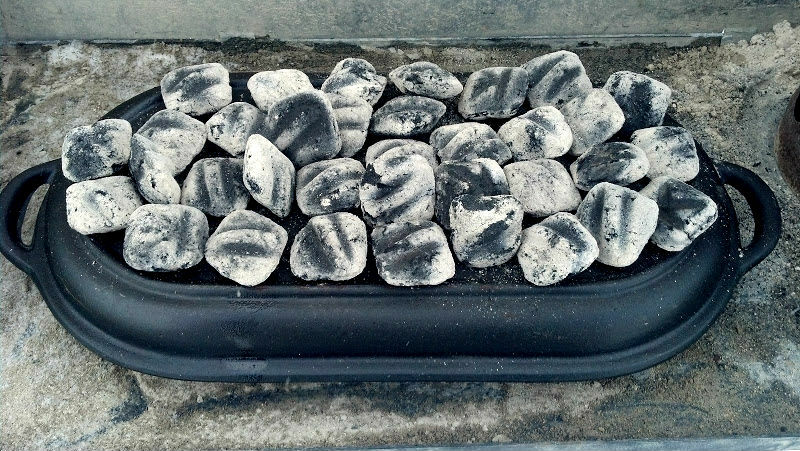 When the coals were white-edged, I took the lid out and put as many coals on it as I could. As I said, I wanted it heck-hot! Another fifteen minutes, and the bread was ready, the lid was ready, and it was time to bake. I put the lid on, and set the roaster on the stand, to lift it up above the coals. I adjusted the proper above and below coals, and let it bake. After about 15 minutes, I lifted the lid and saw that it was nicely cooking. I added the cheese at that point. I actually put on a lot of cheese. In retrospect, I would put on less than half what I did, and I might even wait another five minutes. At this point, It would have probably also been a good idea to remove 6-8 coals from the middle of the top, too. After another ten minutes, the thermometer registered 200 degrees, so I shook off the coals and brought it in. Using a pancake turner, I tipped the roaster and lifted the focaccia out, laying it nicely onto a cooling rack. It sat there, teasing me, for about an hour. In spite of the darkened top, the whole bread tasted amazing. 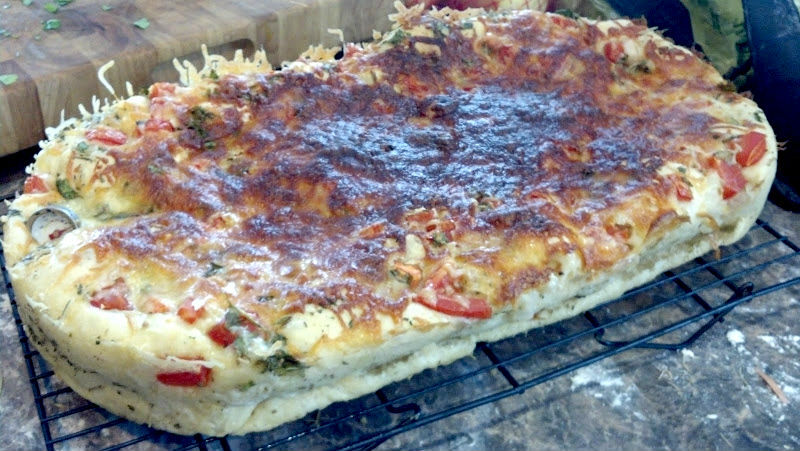 The herb oil and the oil in the dough gave it a richness, and the toppings were delicious. It didn’t have the big holes in the crumb that I had hoped for, but the crumb was deliciously light and flavorful. Do you like cooking with a Dutch oven? Here are more recipes for Dutch ovens.